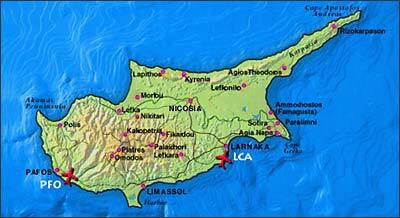 Cyprus, tucked away in the top right hand corner of the Mediterranean and at the South-Eastern corner of Europe, is located between Europe, Asia and Africa and rightly claims to be a stepping stone to three continents (33� east of Greenwich and 35� north of the Equator). Cyprus is the third largest island in the Mediterranean and has been an independent country since 1960 and a member of the European Union since 1st May 2004. 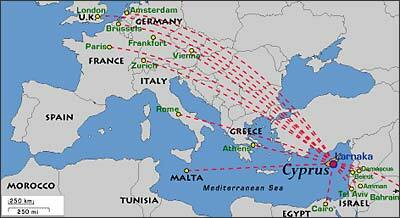 Some of the European and Middle Eastern cities from which Cyprus Airways is flying directly to the island. The hotels in Nicosia are approx. 35-45 minutes drive from Larnaca International Airport and approx. 90 minutes from Paphos International Airport. We recommend that you book a taxi transfer from the airport to the hotel (registration info and form). This costs less than hiring a Taxi. Furthermore, with this taxi service you receive assistance upon arrival and departure at the airport, and re-confirmation of your return flight. Cyprus Airways is pleased to offer 10% discount on all published applicable fares at the time of reservation. The discount will be applicable only on the fare and not on any Airport /Security and any other applicable taxes/surcharges which must be paid in full at the time of issuance of the tickets. The transportation of the passengers is subject to seat availability on Cyprus Airways direct flights and aircrafts at the time of firm reservation. The reservations/issuance and payments of tickets must be made directly to the Cyprus Airways Offices, presenting the Registration Receipt of the participation to the conference. Cyprus Airways will also try to help with the extra hand luggage for the transportation of the necessary fragile equipment of the exhibitors that will be exhibiting in Cyprus during the event. It is important that at the time of booking the exhibitors should mention that special equipment would be carried on the same flight. The delegates may visit the Cyprus Airways web site www.cyprusairways.com to obtain the contact addresses and telephone numbers of the respective Cyprus Airways Offices.